I have been an organizing freak for as long as I can remember. I always want my work spaces to be organized and neat, although sometimes it just doesn't happen. I did want to make sure we had a very organized and strict "command center" I guess you could call it. 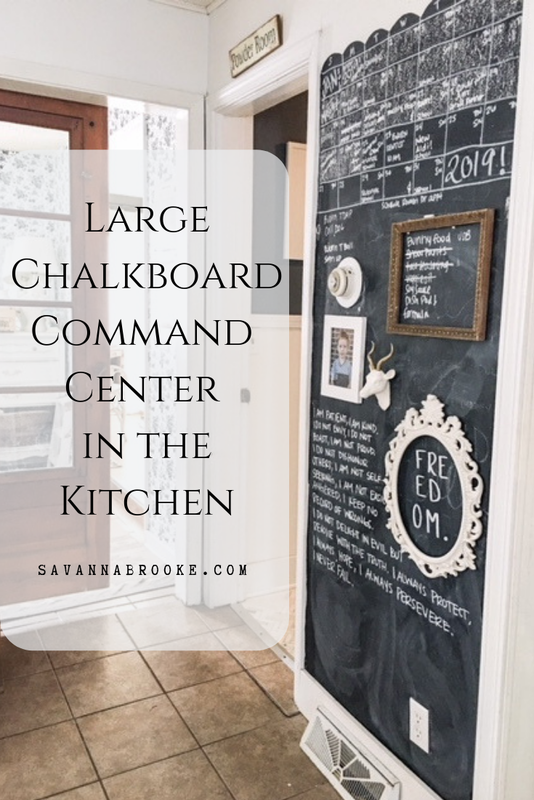 I added this chalkboard wall in our kitchen a couple years ago and it has been a lifesaver ever since! It's big and easy to see and in a place where everyone can easily read it. No excuse for missing something here! I also add in some motivational quotes, things I need to do, a grocery list, our word of the year, etc. Anything I need to remember. I then have these two cabinets to the left above our counter where I keep an actual calendar so that I can write down appointments that are later in the year so I can easily copy it onto the chalkboard when the month comes. In the other cabinet I have important phone numbers, lists I've made, Bjorn's school calendar, etc... (I blurred some things out for privacy purposes) Things I don't want to be seen but I need to look at. Normally people keep this kind of stuff on the fridge but I like my fridge to be cleared off. And last to the right hanging on the cabinet I have the basket that I keep all of my MOM stuff in.... Chalk for the chalkboard, tape to write Bjorns name on his school stuff, pens, envelopes and thank you cards, gum, a microfiber cloth for cleaning off the chalkboard (I find this works best when trying to get the chalk and the chalkboard markers off) scissors, lighters, bla bla bla... Not the prettiest but it works for us. I love this system so much. It's kept us organized, anyone can write on it so I know what is happening everyday. It's easy to glance at while eating dinner so I know what to get done the night before depending on where the boys are going. I definitely suggest if you do this to put it in the heart of your home. Where you spend the most time and where you are most likely to look at it everyday, multiple times a day. I hope this gave you some inspiration for your home and organizing your chaos! If your goal this year is to get more organized, this is a great place to start. 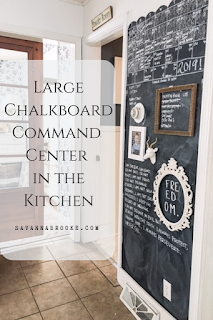 We couldn't live without our big "command center" Let's face it, we all have a little cray in our lives so the less stress we have, the better. I hope you have a wonderful rest of the week, friends!